Unmask My City is a campaign led by healthcare professionals to call on governments around the world to act on air pollution. It launched globally in 10 cities on the 1st of May 2017 and is coordinated by The Global Climate and Health Alliance (GCHA) and its international partners. It acts as a platform where doctors, nurses, public health specialists and other allied health care professionals can share air pollution data, evidence on health impacts and advocacy tools. As a junior doctor, and a future psychiatry trainee, I was glad to have been asked to get involved with the London campaign. It was a little bit tricky to explain that I was currently getting more experience working in physical health and that I actually wanted to be a psychiatrist in a simple visual, so for the purposes of the campaign I was simply an A&E doctor, and they used an exciting quote. However, my interest in the integration between mental and physical health, and coming up with joined up ways of working is one of the main reasons why I believe that psychiatrists should care about air pollution as well. There is now more and more evidence that as psychiatrists we need to act on behalf of our patients to protect their health. Air pollution is now responsible for over 6.5 million premature deaths per year, and impacts from fine particulate matter in particular, have been linked to increased risks of heart disease, respiratory diseases, lung cancer and stroke. More recently there has been both epidemiological data showing an association between living close to a road and Alzheimer’s disease, and neurobiological research from animal models that breathing air pollution affects brain tissue directly and can lead to abnormal protein deposits, cerebrovascular damage, and cellular stress. Work has also began to explore impacts on depression, and behavioural development in children. Action on air pollution is an opportunity rather than a burden. 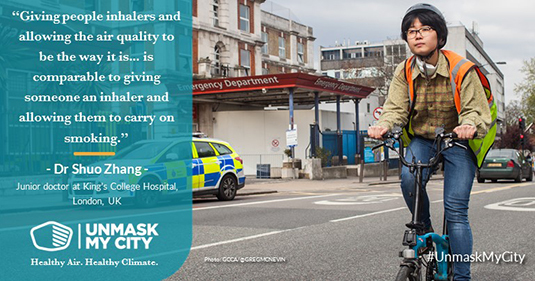 A robust Air Quality Strategy will support local authorities to increase cycling and walking accessibility, promote electric vehicles and restrict the most polluting vehicles. Through this investment in local infrastructure we also have the chance to strengthen local health networks and reimagine what our hospitals, gp practices, schools, roads and parks could be like for future generations. It is a positive change towards making our cities and communities better places to live for everyone. There could be more of projects like the The Lambeth GP Food Co-op, featured in the London UnmaskMyCity Campaign FactSheet. It connects the dots between chronic diseases, food security, and the NHS supply chain, and aims to cut food transport miles and improve patients’ physical and mental wellbeing. The Government Air Quality Strategy is to be finalised by the end of July 2017. Health professionals are calling on the UK government to support the implementation of Clean Air Zones in UK’s major cities. As Psychiatrists we should join that call. We have the potential to ‘ tackle climate change, reduce the burden on health services and create new economic opportunities’.